Who could not be amazed at a large, white owl with penetrating yellow eyes, prevalent during daylight hours for all to see? 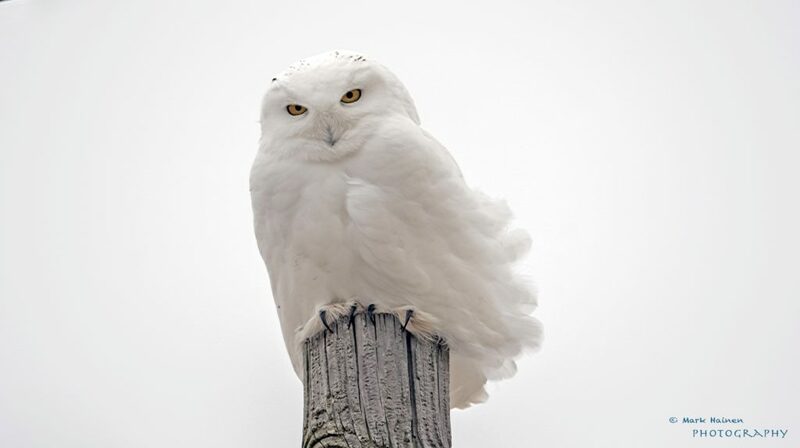 We have an exciting winter already in Michigan, with the appearance of so many Snowy Owls in our state. 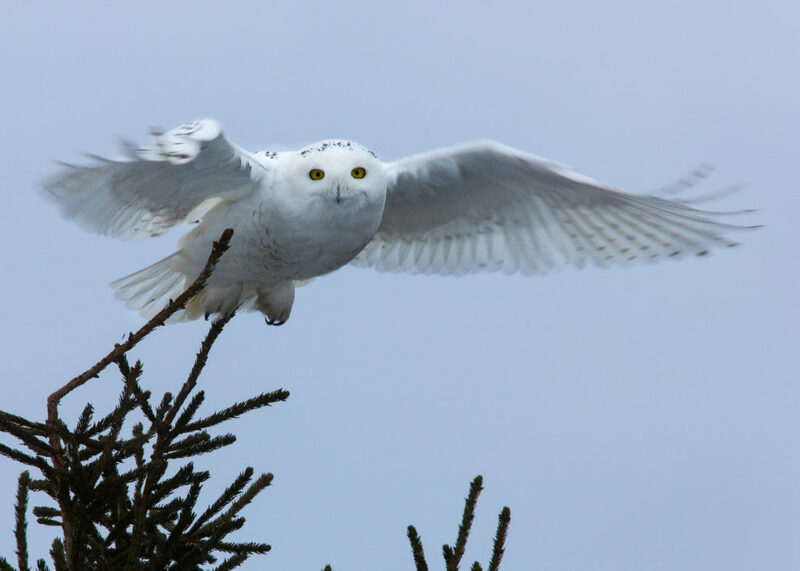 According to eBird reports (click here to learn more), the Great Lakes region has a higher influx of Snowy Owls than anywhere in the United States so far this winter. Locally, there has been a consistent sighting of this yellow-eyed marvel at the Grosse Pointe Yacht Club. The bird is usually seen at the farthest point of the property closest to the lake, surveying for potential prey. 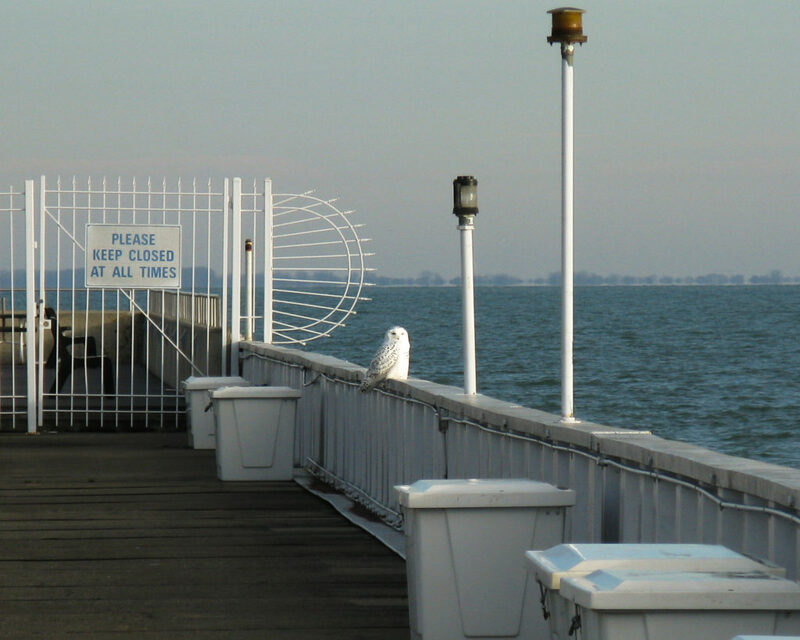 A Snowy Owl has also been seen at The Ford House a few times, and on a boat house near Jefferson and Ten Mile. The DNR boat launch site in Harrison Township has also been a fairly reliable spot to see these Arctic nomads sitting on the break wall. Many parts of our State resemble the Arctic tundra with wide open spaces that Snowy Owls are accustomed to occupying. They may be found along the shorelines, in airport fields, farm fields, and our protected natural areas. A true testament that these birds think nothing of our winter weather! The hunting must be pretty good out there with the abundance of waterfowl to feed on. Therefore, what we are seeing now most likely indicates that Snowy Owls had an extremely successful breeding season this past summer, coinciding with an abundance of lemmings, their predominant prey. Interesting fact – one Snowy Owl can eat 1,600 lemmings in a year. When there is more food available for feeding young, the females will lay more eggs. When food is scarce, female Snowy Owls may lay as little as three eggs; in years of abundant prey, they have been known to lay up to eleven eggs. Nests are simple scrapes on the ground. The Snowy Owl female is the one who builds the nest, scraping out a shallow hollow on the bare ground. She shapes it by pressing her body into the depression, taking a few days to complete the scrape. The owls may reuse the nest site for many years. Eggs are laid every other day with a 32 day incubation period. Males may have bred with two females, keeping them a kilometer apart and assisting with the rearing of both broods of young. On their breeding grounds, male Snowy Owls execute a fascinating mating display. First the male rises into the air with exaggerated wing beats in an undulating flight, holding a lemming in his bill or talons. Then he descends to the ground with wings flapping or held in a “V.” He drops the prey on the ground, stands erect, then lowers his head and fans his tail as the female approaches. To defend his territory from another Snowy Owl, a male lowers his head and sticks it forward, extending his wings and raising the feathers on his neck and back to seem bigger. Since lemmings aren’t breeding in the winter, there is less food available for the Snowy Owls right now. As well, Snowy Owls are territorial in their wintering areas, defending their winter territories fiercely, even engaging in combat with other Snowy Owls. All of these factors cause them to roam into southern areas in search of better food sources. Our Great Lakes provide an abundance of ducks, just as our farm fields provide an abundance of voles and mice. Small prey is eaten whole, with the bones, teeth and fur of their prey being regurgitated as pellets. Snowy Owls have a tendency to frequent the same spot to perch – I wonder how many pellets are sitting in a pile at the Yacht Club? 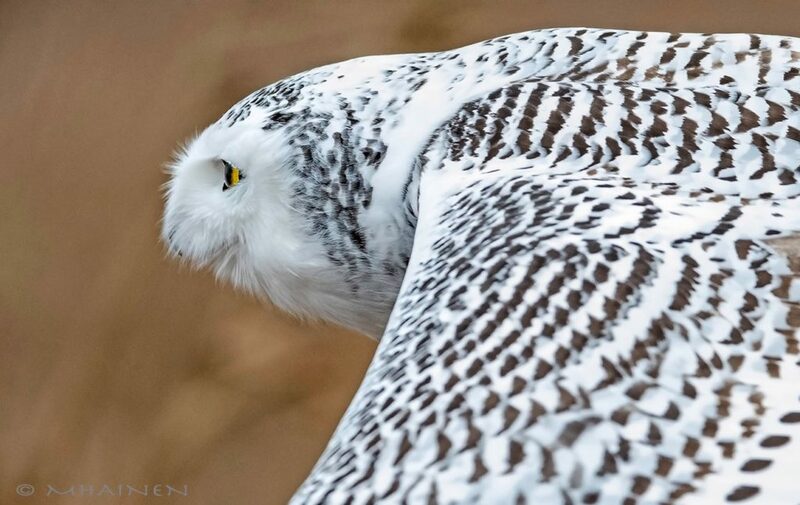 Snowy Owls are the heaviest owls in the United States, weighing between 3.5 and 6.5 pounds with a wingspan of 49 to 59 inches. Their average life span is ten years. The oldest-known Snowy Owl was a female, at least 23 years, 10 months old when she was recaptured in 2015 during banding operations in Montana, having been originally banded in Massachusetts in 1992. Keep your binoculars ready and scan along the shoreline. 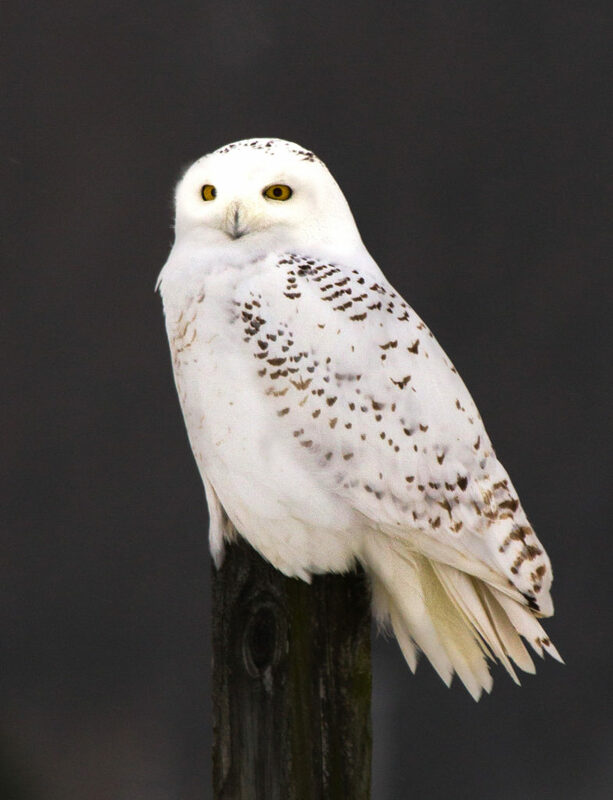 Unlike other owls in our area, Snowy Owls are diurnal, hunting during the daytime. Your potential for seeing one is not as unusual as you might think!